I often prepare them, for breakfast, with a glass of milk, for snack with a cup of tea or coffee, or whenever I crave for something sweet… I could eat them all the time. I like that they are simple, yet so delicious. My family and I prefer cookies that are not too sweet, but you can always add some sugar, if you wish. I usually make double dose of Chocolate Chip Cheesecake Cookies so that we can enjoy them for a few days. Instead of mini chocolate chips, you can use pecans, M&M candies, sprinkles, Oreo cookies or any ingredient that you like, and make your perfect combination. You can make a double dose, or two or more combinations. In that way you get a couple of different tastes, from one piece of dough. 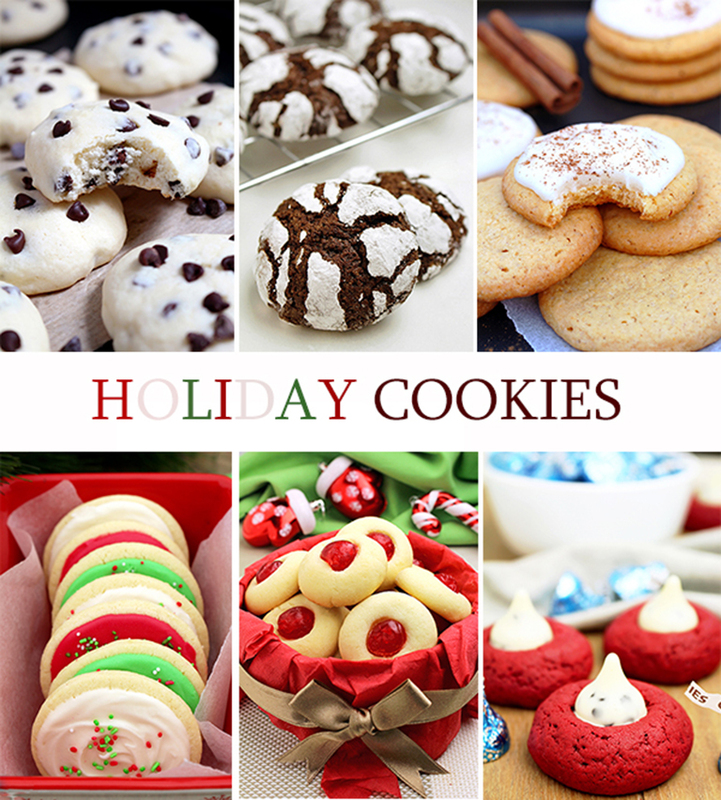 My husband loves Carrot Oatmeal Cookies and Holiday Maraschino Cherry Shortbread Cookies , my son‘s favorite are Christmas Chocolate Crinkle Cookies and my favorite are Chocolate Chip Cheesecake Cookies. 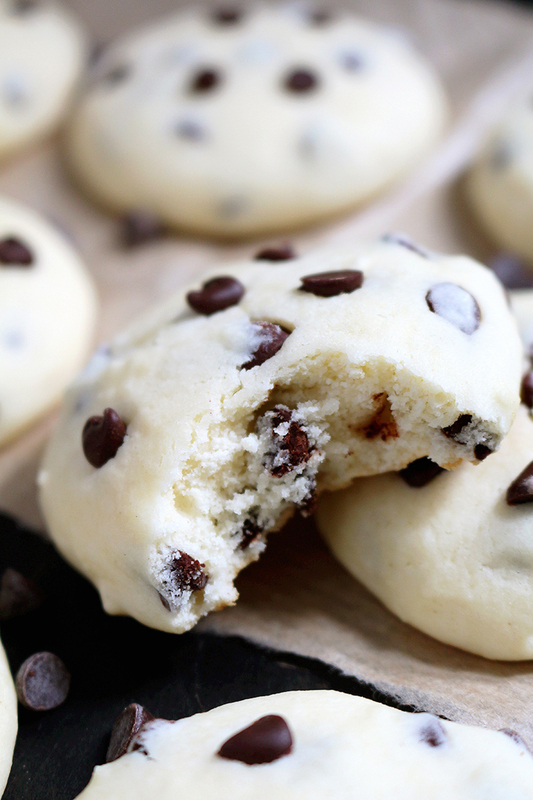 What do you need to make this Chocolate Chip Cheesecake Cookies? They can be served with a cup of tea, with your friends, or as a snack between two meals. While typing this, I‘m eating this delicious Chocolate Chip Cheesecake Cookies and finding inspiration for new ideas. 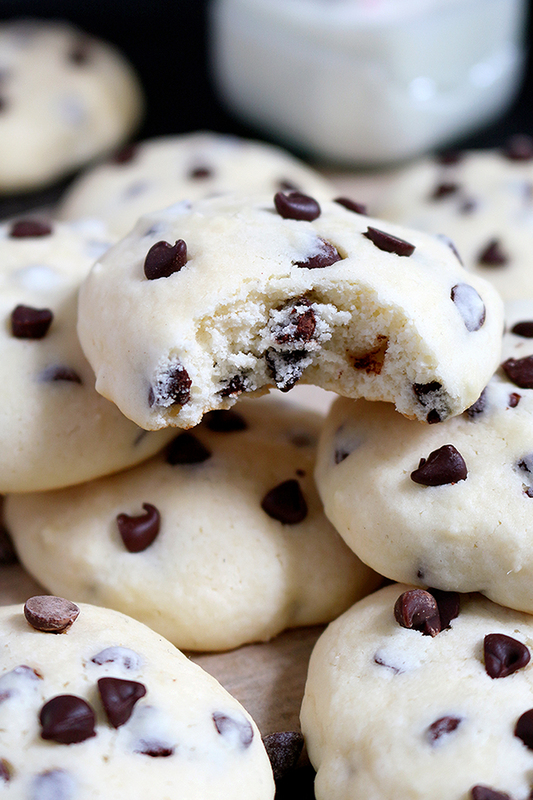 We love this great combo of mini chocolate chip and cream cheese. My family and friends are always so excited when I make them. Take some time; make your family and friends happy with these simple, soft and chewy cookies. 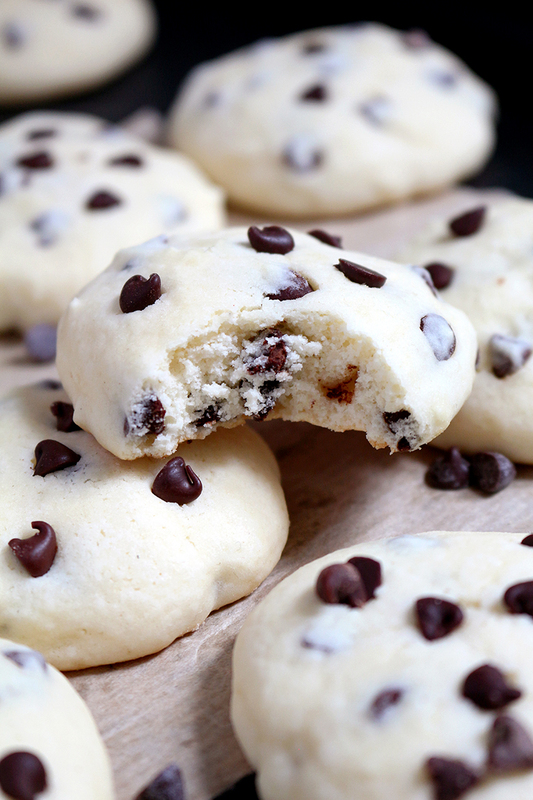 How to make Chocolate Chip Cheesecake Cookies? In a medium bowl combine flour, cornstarch and baking powder. Leave aside. In a large bowl mix butter and cream cheese, with an electric mixer on medium speed, until it is fine and creamy. Add an egg, milk and vanilla extract and continue mixing. Then, add powder sugar and mix some more until the mixture is fluffy. Add dry ingredients and mix until you get fine dough. Finally, add mini chocolate chips and stir well. Leave in fridge for an hour. Preheat the oven to 375 F. Line two baking sheets with parchment paper. Take the dough out of the fridge. Shape it into balls (24-26 balls). Place them in the baking sheets, 1.5 inch apart. Flatten the balls using your hands or some firm object. Sprinkle some mini chocolate chip, if you wish. Bake for 10 minutes. Take them out of the oven and leave to cool in the baking sheets for a few minutes. Transfer them to a wire rack to cool down completely. So tasty, delicious and easy to make! 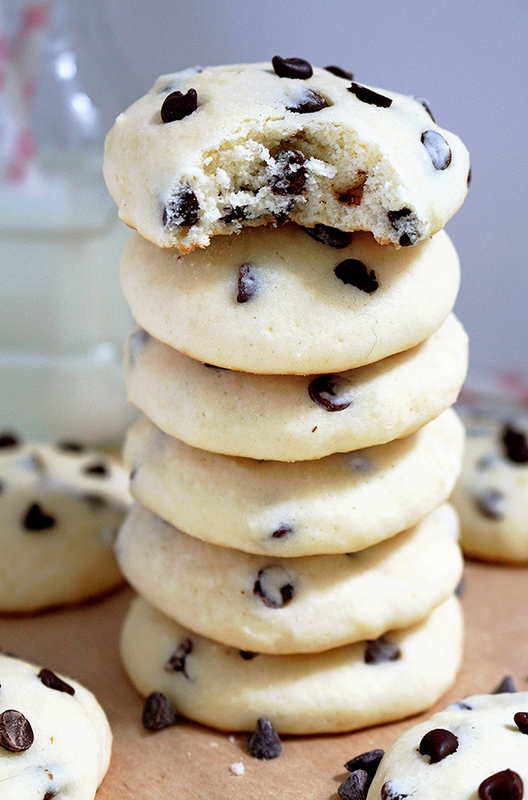 I love this Chocolate Chip Cheesecake Cookies because they aren`t too sweet and heavy (100 Calories per cookie). In a medium bowl combine flour, cornstarch and baking powder. Leave aside. In a large bowl mix butter and cream cheese, with an electric mixer on medium speed, until it is fine and creamy. Add an egg, milk and vanilla extract and continue mixing. Then, add powder sugar and mix some more until the mixture is fluffy. Add dry ingredients and mix until you get fine dough. Finally, add mini chocolate chips and stir well. Leave in fridge for an hour. Preheat the oven to 375 F. Line two baking sheets with parchment paper. Take the dough out of the fridge. Shape it into balls (24-26 balls). Place them in the baking sheets, 1.5 inch apart. Flatten the balls using your hands or some firm object. Sprinkle some mini chocolate chip, if you wish. Bake for 10 minutes. Take them out of the oven and leave to cool in the baking sheets for a few minutes. Transfer them to a wire rack to cool down completely. Store them in well sealed container, at a room temperature, for about three days. Oh, my goodness. These sound SO GOOD and easy to make! We love cheesecake because it isn’t too sweet so these sound perfect. Your photographs add fuel to the fire. Going to make them. I first need to go get some of the ingredients I don’t have. You can replace egg with 1/2 of mashed bananas or 3 tablespoons of puree apple.. then it’s necessary to add another 1/2 tsp of baking powder. I didn`t try, but I am sure cookies can be frozen up to 3-4 weeks if stored correctly (in airtight container). I love this recipe, so tasty and delicious! For reason I’m really hungry right now! Thanks for the recipe, a nice addition to my afternoon tea. These really look delicious! It’s interesting to me that the recipe calls for 1/4 cup cornstarch. Does that cause the texture to be lighter? Thank you, glad you like it. Main purpose of cornstarch is to cause a fine texture of cookies. I’m out of cornstarch, so I looked up on the Internet for substitutes and I found ground flaxseed. I made these cookies once before and they were delicious! I will get back to you to let you know how the flaxseed work. Can I use potato starch instead of corn flour? I think you could use potato starch as a substitute. Loving your version of cookies. Definitely gonna try this! Ty for recipe… But what can i use instead of egg?? You can replace egg with 1/2 of mashed bananas, 3 tablespoons of puree apple.. then it’s necessary to add another 1/2 tsp of baking powder. I have a daughter who is highly allergic to egg. We use Ener-g egg replacer. Works awesome. Wow! It looks delicious. Thanks for sharing. Do you have the nutritional values? I’m on weight watchers and need the breakdown. I added nutrition information to the recipe. How big is each cookie? When shaping them, how much dough do you use? A tablespoon? I used 1.5 – 2 tbsp of dough. Cookie size is about 2.5 inches. Any way to replace the corn starch? Thanks for stopping by 🙂 You can replace 4 tbsp of cornstarch with 8 tbsp of all purpose flour. I’m thinkong blueberries instead of chocolate chips. Do you think coconut flour could be substituted? thanks for stopping by. Yes, you can use blueberries instead of chocolate chips. I`m not sure about the substitude for coconut flour..
thanks for stopping by 🙂 Purely subbing in gluten-free flour doesn’t always work. Because gluten is a structural protein, the products are often very tender and even crumbly. So I`m not sure about using gluten free flour instead of all purpose flour. It should be fine with simple cookies, but.. I absolutely love these cookies. I just made them tonight. I did not have powdered sugar on hand so I used 1 cup of regular sugar. It came out so delicious. Thank you for sharing. I wonder if this would taste good with a hint of mint. My daughters birthday is coming up and she love mint chocolate. Do they sell mint chocolate chips. I know she would love it! thanks for stopping by. You can add mint extract, but I didn`t make it that way, so I`m not sure about the taste. I suppose it should be fine..
You could break up some mint MMs. Hi Dragana, I’m about to make a batch tonight. I was wondering, will these babies last longer if stored in the fridge? Would you even recommend storing it in the fridge? I wouldn`t recommend storing cookies in the fridge, because they will lose the softness and freshness. Thank you for the recipe though! You can try with airtight container, to keep the freshness. Should 1/4 cup or 4 tbsp cornstarch be used in recipe? I read freference to 8 tbsp all purpose flour as substitute for 4 tbsp cornstarch? I used cornstarch for this recipe in order to get the fine texture of cookies, but you can use flour as a substitute for cornstarch, in proportion 2:1. Hi can I check is this a soft cookies or crispy cookies? Is it 100 calories for 1 cookie? If not how many cookies for 100 calories. Thanks! Thanks for stopping by. 100 Calories per cookie. I just wonder if there’s any replacement for the cornstarch? Could I just omit it? Thanks, I am glad you like it. You can substitute flour for cornstarch, but you will have to use twice as much flour as cornstarch. My sister sent me this recipe and asked that I make them for the family reunion. I doubled the batch and they were a hit! I was hoping to have some left over, but they were gone in a flash. This is a very light, tasty cookie. Super easy to make!! Definitely a recipe to keep!!! unfortunately I didn`t make with salted butter. I suppose it would be okay with something simple like this cookies, but.. I almost always only purchase salted butter. So it’s what I had on hand when I made these cookies. They came out very good! Did I miss oven temp? Can u give cup measurement? Leave cookie dough in a fridge for an hour, before baking. Hi Amy, I didn’t try but I think it would be okey. I made these cookies the other night, and they were a big hit! I followed the directions as is, but the texture of the cookie came out like a lighter scone\biscuit texture, is that right or did I mess something up with the recipe? Glad for big hit 🙂 Cream cheese and cornstarch gives lighter and fine texture to cookies. I will be making these for a chocolate chip cookie contest here on base. All other recipes call for some brown sugar. Yours doesn’t. So no brown sugar is needed? If I add any, how much should I add? If you want to use brown instead of powdered sugar, you can add 1 1/2 cup of brown sugar. When you replace egg are you saying 1/2 mashed banana AND 3 T puree apple or 1/2 mashed banana OR 3 T puree apple? Thanks! You can replace egg with 1/2 mashed bananas or 3 T of applesauce. Can these be made as cookie BARS? If so, which size pan would be best for this amount, and would there be a change in oven temperature? Thank you for any input on this. You can try to make these cookies as bars. Preheat oven to 375F and line an 8×8 inch baking pan. Bake for 25 min or until a toothpick comes out clean. These cookies look amazing. Is it possible to use gluten free flour and if so what type and quantity? Purely subbing in gluten-free flour doesn’t always work. Because gluten is a structural protein, the products are often very tender and even crumbly. So I`m not sure about using gluten free flour instead of all purpose flour. It should be fine with simple cookies, but..
Hi, in the final note says to be stored for three days, is this the time they last in good condition or is it to have better taste? hi i love your website, i am 13 but i love to bake, and cook for my family. cheesecake is my favorite dessert so i am deffenitly going to try this one!! Would these come out ok if you cut them into shapes using cookie cutters? I didn`t make it that way and I`m not sure whether it would work. Is cornstarch the same as corn flour? Sorry, I’m not from US and I really want to try this recipe. Cornstarch is called in the USA and Canada. Cornflour is called in the UK. Great recipe…In the spirit of the holiday season beginning, I added about a quarter cup chopped dried cranberries to my mixture for some color….delish! Thank you Paula, so glad you loved it! Baked these and they were all gone within minutes between 3 kids. They loved it! My youngest said that they were really good. Thank you for a wonderful & delicious recipe – all the way from Singapore. These were great! Perfect soft texture and just enough cheese-cake feel for a cookie. I put cream cheese frosting on top of them and they were to die for! Thank you so much Nicole, I`m so glad and really appreciate your feedback. If you want to add 2 oz of cream cheese more, you need to add 1/4 cup of sugar more. I made these with tofu cream cheese. Delicious! One problem, the dough was really sticky so I ended up with not so nice looking blobs. Yes, they are delicious 🙂 Maybe it’s about tofu cream cheese. I didn’t have that kind of experience with cream cheese. They look so cute! The cookies are amazing and I would love to make this color very soon. Thank you for sharing the recipe! Cheers. Hi! I am thinking l’d like to try this recipe with cinnamon chips and adding some pumpkin pie spice to the batter. What do you think? What quantity of pumpkin pie spice would you suggest? Thanks! I didn’t make on that way, but you can try and send me some feedback. My mind is working over time at different things. I can put in them all different flavors of chips chopped. Maybe small chopped fruit. Thank you so much for this recipe. Thank YOU Maggie 😃 You can try to add. Hi.Thanks for chocolate chip cheesecake cookies from Sweet Spicy Kitchen. I didn’t make on that way, but you can try with powdered coconut sugar instead of powdered sugar in proportion 1:1. Hi. Am I able to dye the cookie dough with food coloring? Since it’s going to be Christmas; green or red. Thank you! I just ate 6 in a row of my first batch ever: the best cookies I have ever made (taste, texture). I am no expert- not even intermediate level- at cooking cookies, but this recipe was easy to prepare, yet better than all the others I have tried. I followed one of the replacement suggestion: instead of mini chocolate chips, I put Oreo cookies. I bought cream cheese and Oreo cookies just to try this recipe. I thought it would do a great taste, and it is perfect for the texture and taste of the cookies. I put 6 whole Oreo cookies in a plastic sandwich bag, put the bag on my cuting board, took a ladle and hit the cookies to crumbles. I don’t do cookies much (I find muffin recipes are easier to make), but this recipe I will do again for sure! Yes, but its a matter of taste and personal perception of it. So good! And so simple. My family loved these! Thank you. How can I replace sugar witg honey? 1. For every 1 cup of sugar, substitute 1/2 to 3/4 cup of honey. 2. For every 1 cup of honey you’re using, subtract 1/4 cup of other liquids from the recipe. 3. Add 1/4 tps baking soda for every 1 cup honey used. 4. Reduce the temperature of the oven by 25°F. Can these cookies be frozen up to 1 month? planning for a wedding. Thank you, they look so yummy! I didn`t try, but I am sure cookies can be frozen up to one month if stored correctly..